Having Bluetooth built into your car or truck radio is a nice feature to have, from playing music with your Bluetooth device to hands-free calling. But What if Your Car Stereo Has No Built-in Bluetooth? 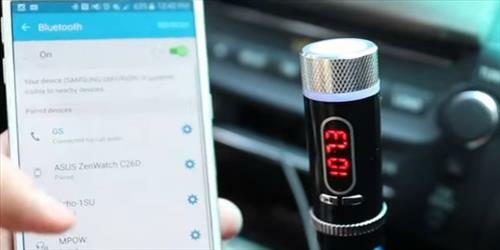 Adding Bluetooth to any car stereo is easily done with a FM transmitter or units that use an audio line-in. There are many units available that come in different designs and features. The kits are low cost items that are easy to hook up and have your vehicle stereo system Bluetooth ready in minutes. Read Below to see our picks for the best kits. Most kits are FM transmitter kits which basically transmits to your car stereo the same way a radio station does. Setting up a kit is easy and can be done in a few steps. 1…To setup a FM kit the car stereo is set to a open frequency that no radio station broadcast on. 2…The FM transmitter is then set to the same frequency. 3…The transmitter can then talk to any Bluetooth device and broadcast it over the cars speakers through the radio. There are also Auxiliary audio line-in kits that use a standard 3m audio jack line that plugs into a stereo. In full disclosure these units below have been sent to us from companies to review which we have done with our own honest opinion and results. As Always be sure to read the reviews on Amazon, forums, here, or elsewhere to be sure a unit is a good fit for you. 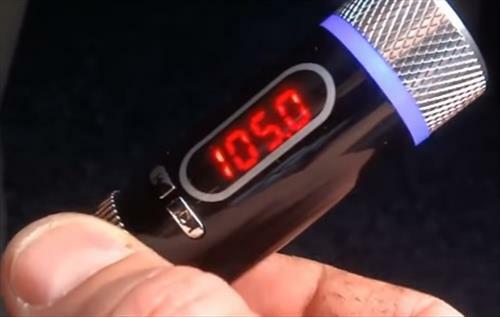 The HK106 is a nice Bluetooth FM transmitter kit that has a good display and works very well. It has a built-in microphone, SD-card slots, 2 USB ports, and a 3.5mm audio line-in for any non-Bluetooth device. 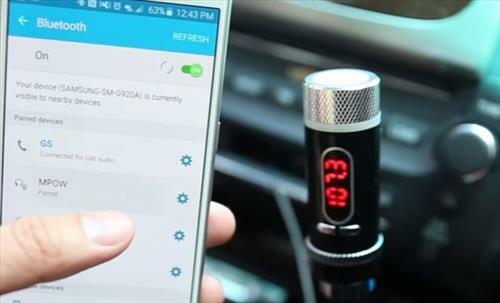 iClever makes this small unit that converts any car radio into a Bluetooth stereo. Like all FM units the radio is set to a open frequency and the iClever than set to the same frequency. It will than automatically transmit over the speakers. It is a stubby unit and doesn’t have much length which makes it ideal for cigarette lighters that are located on the dashboard. If your vehicles cigarette lighter is located deep in a console than another unit would be better. Anbero makes this FM25 model that is built with more length. This makes it more ideal for cigarette lighters that are inside a console or deep in the dashboard. It is a FM unit that also has two USB ports to charge devices. The extra USB charging ports are nice to have since many units don’t have this feature, and limit charging when only one cigarette lighter is available in a vehicle. This unit from Regetek uses an audio line-in to transmit to a radio and add Bluetooth. Some radios don’t have an audio line-in so be sure to check yours if there is one or not. These types of units have an advantage over FM transmitter units since they don’t need a open FM signal. Large cities often can have so many stations they can interfere with a FM transmitter style unit. If you live in such an area and have a radio with an audio line-in than it is worth a look. This unit from AUKEY ties into a stereo audio line-in and then connects to your Bluetooth device. It doesn’t have a built in mic so there is no hand-free calling but plays music nicely from your devices. Geartist makes the GB01 which is a low cost FM transmitter kit. It is connected from a USB power cable that makes it a good fit into most any vehicle. The cable also lets it be placed more strategically to get the best results from your smartphone or other devices. If your car stereo has no built-in Bluetooth than adding it is a easy task to do. There is no need to replace the existing stereo with another expensive unit as a cheap low cost conversion kit is quick and easy to do. Of course it will not improve the sound of your car system so if it is a old unit and sounds horrible it may be time for a upgrade. If your system still plays fine than a small kit will be all you need. Since it is using the existing system the kits only sound as good as the built-in unit. Fm type units are the most used but Aux line-in units also work well and can be of benefit in areas that has a lot of FM signals. This is also true for those who travel a lot, as a open signal may start broadcasting from a station. An audio line-in style unit would work better in such a scenario. What works for one person may not work for another, so be sure to read the reviews on Amazon or elsewhere to be sure a unit is the right for for you. There’s another 3.5mm line in Bluetooth device that’s about as big around as a silver dollar. It’s called the Blue Jax. It’s a simple setup. Just pair it with your phone, plug it in to your aux input on your stereo and your listening in minutes. Everything is controlled by the big multi-function button in the center of the device. All the instructions are included with the device. It’s rechargeable via micro usb charging cable, such as your phone charger. Give it a try, I don’t think you’ll be disappointed. Plus for around $30, it’s worth a shot. I wouldn’t do without mine, especially to eliminate the aux cord which always got tangled or hooked on something. I got mine at Best Buy, but I’m sure they’re available elsewhere. Do you want to listen specific to the radio or not, just some music or your personal click with some radio station ? Those answers can make a wholelot difference money wise. I have a car radio installed into a caravan, everything works fine but if I want to listen to the radio outside or in the awning then I have to turn the volume up to an unacceptable level. Is it possible to take the radios audio output and connect a bluetooth transmitter so it can also connect to a bluetooth speaker.